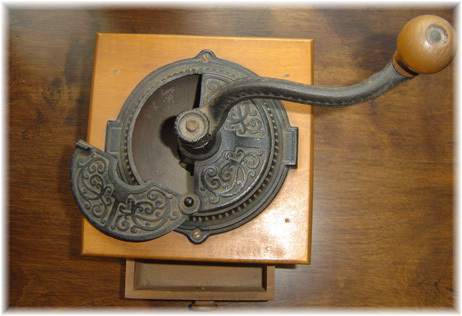 I love this antique coffee mill that was hubby's grandmothers. There are no markings that I see, and I have no clue how old it is. He said it's just always been in her kitchen that he remembers. It's in wonderful condition! How nice to have an item that brings on memories of hubby's grandmother. that is a beautiful old mill. even nicer because you are related to it. does it still grind? have you dared to try? It appears to still be functional, I did crank it a bit, but I am worried about using it and possibly breaking it. I wish I knew more about it and when it was last used, it might help alleviate my fear of using it. I love stuff like this, especially when there are family memories to go along! I have a handful of antiques but agree the ones that came from family members are the best. 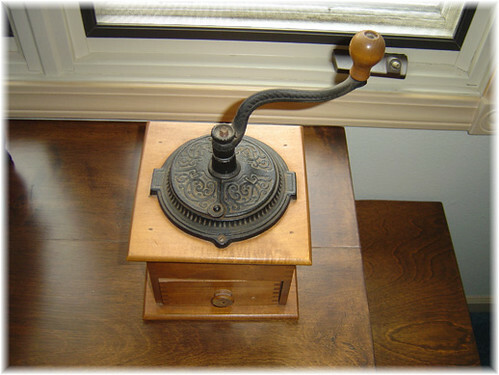 I think my parents had one of these in my old family home. Great to have things passed from family. I have some bits around the house that are treasures. Im getting ever so nostalgic reading your posts tonight , its making me remember many a time in my parents home and our trips.